This small, early nineteenth-century terraced house was the home of Khadambi Asalache, a Kenyan-born poet, novelist and civil servant. 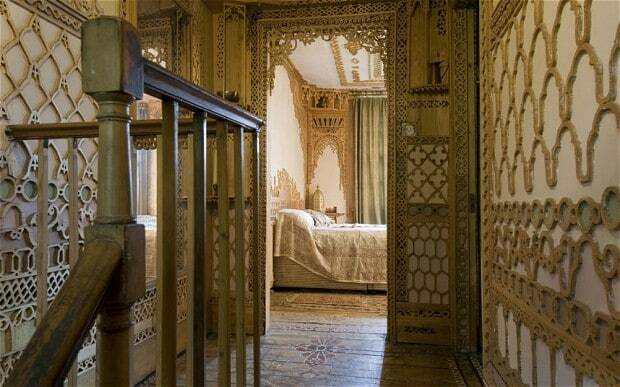 In 1986, he began carving wooden fretwork to disguise a persistent damp problem in the basement dining room. 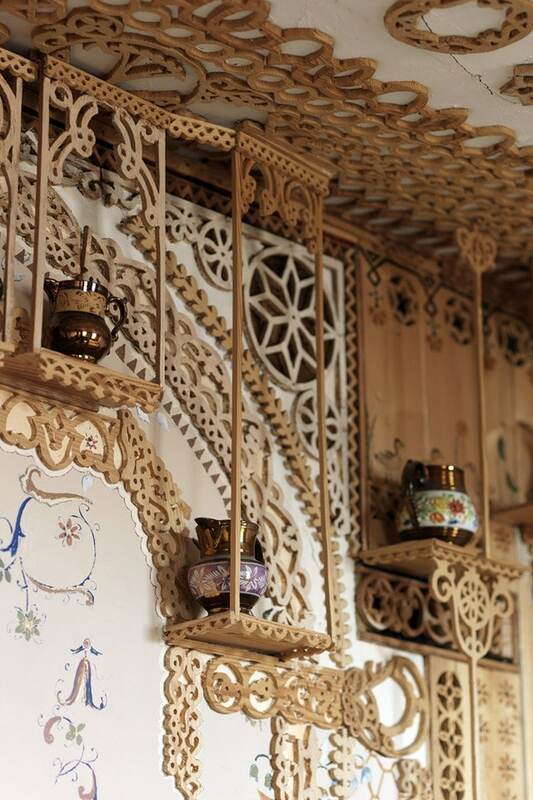 He went on to embellish almost every wall, ceiling and door in the house with fretwork patterns and motifs which he hand-carved from reclaimed pine doors and floorboards found in skips. 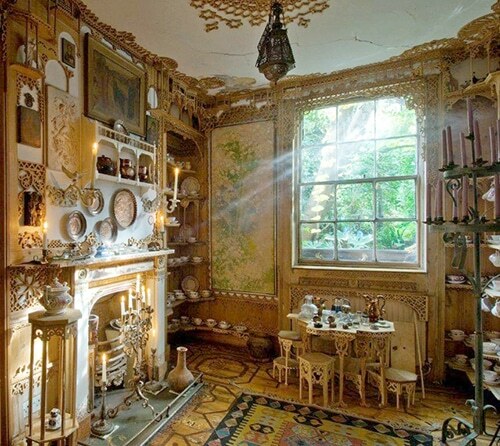 Over the course of a twenty year period he turned his home into a work of art. He did not like for his friends to take pictures, because pictures mediate between you and the experience of place, and they also mediate your memories. Nothing could give you a true sense of what it means to be physically present in this house, so if you have the ability to come to London, to stand here, maybe stop reading now. Don’t look. But if you cannot get here, then a pale reflection can help you understand what follows. I confess I liked being in this space without taking any photographs. But I also like these photographs from the website, for they frame and capture scenes in this place of almost overwhelming detail that allow you to isolate small portions and spend more time over them, to gain access to someone else’s framing of the space to see what others see. A few things that struck me the most about this incredible place. 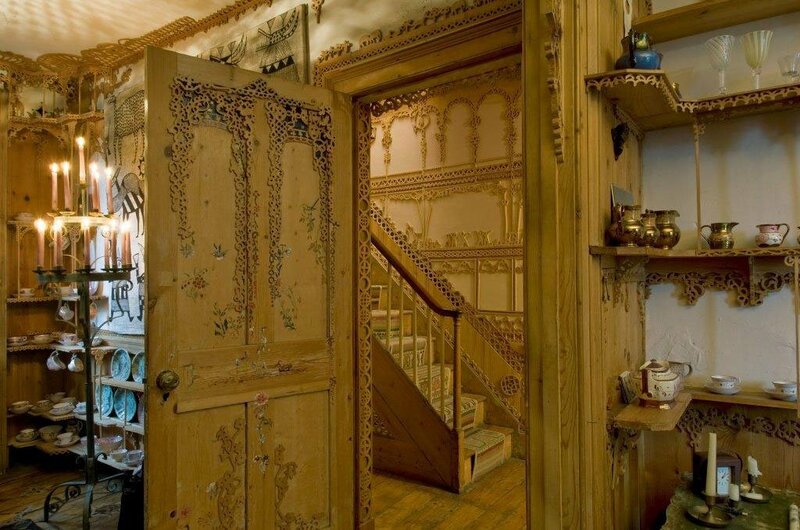 First the ways in which this incredible 20-year labour of detailed carving and fretworking and painting carved a space out of London that had nothing to do with London at all. Not an escape perhaps, but an alternate universe, a sidestep through a carved door into a place of beauty and safety and memory. Complete in itself, indifferent. It’s only the garden out the back that it calls on, its mimosa tree repeated and made soft, forever muted green in paint. Asalache created a completely different world of shadow and light and wood, maximised every last glimmer of sunshine in this often gray and gloomy place through glass and porcelain, through subtle and hidden touches of gold paint. Our guides also mentioned how this house reflected Asalache’s philosophies as he carved a work that was beautiful, harmonious, forever unsymmetrical (though containing much symmetry) and forever incomplete. I think creating such intricacy across the whole of the house meant that not designing in a symmetrical way was more difficult — though this provoked laughter I am still a little hurt by. I don’t know why. But simply to mirror one half across another is easy, a mechanical operation that surely would have cut the time required (though of course to do it with machine like precision might not be). Instead, balance and harmony must emerge from some level of deeper awareness and attention as new forms are created to form a larger sense of wholeness that does not jar, that feels right and fitting in its difference rather than its sameness. This seems to me infinitely harder, worth a deeper appreciation. 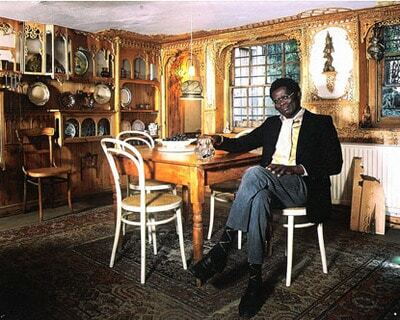 He started in the kitchen, and he finished this room before moving to the next. There is an aspect to this house that made me initially think of obsession, made me think of the Watts Towers meticulously crafted over decades in a work that would never and could never be finished. There would always be more to do, more to add. The edges of things were all left rough, splintery, though they often incorporated smooth wood carvings rescued from jettisoned paneling and furniture in Lambeth’s great 1980s wave of gentrification and rebuilding. Almost all of the wood was found in skips, saved from this Georgian neighbourhood being gutted by money and development. I love that Asalache could finish, and that part of that finishing was to leave sections unfinished. 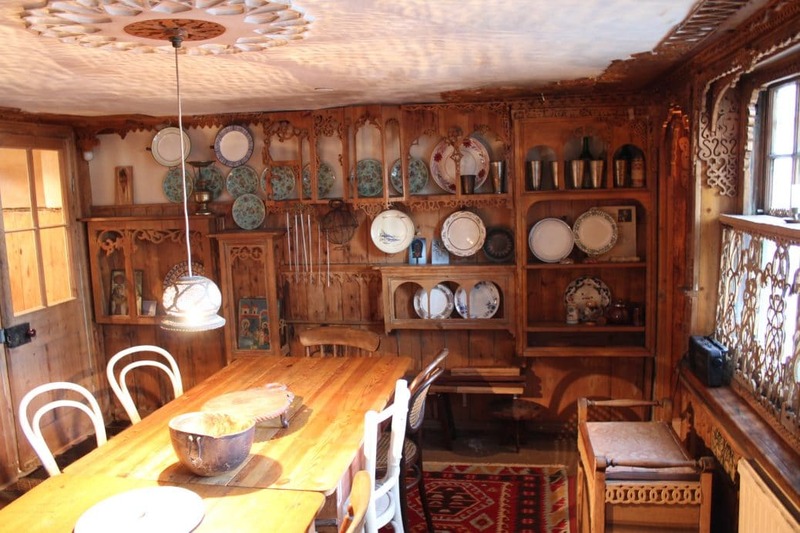 There is one shelf in particular in the dining room where fretwork adorns one half but not the other — left deliberately along with the other aspect of unfinishedness so as not to overwhelm his friends according to our guides. I stared at it…wanted to finish it myself. It is provocative, makes you think about this shelf as it fits into the room, fits into the house, fits into an ability to be incomplete, imperfect. The house is full of other examples, but none so marked as this one I think. A topic for discussion at dinner perhaps. I loved this long table, the conviviality it implied and memories it must hold of collective talk and laughter and breaking of bread together. I loved how each room was different, loved the floors with patterns mirroring the rugs (the rugs were there first and the patterns painted in harmony with them), loved the doors decorated on only one side, loved the figures dancing, the multitudes of animals and birds carved and painted delicately on walls. Loved the beauty of the objects and the precision of their placement. Loved how this still feels like a space to be lived in, despite its beauty and fragility. I loved this house. To be here on a tour of only six, guided slowly by people who love it too, who know it so well, who can point out the parrot with a looking glass, the ancient Egyptians with a telephone, the painting of a man falling that a friend had snuck upstairs to do. All wonderful. I hope to come back, this is a place you will always find something new. I found some of his poems too, though his most famous novel, A Calabash of Life, is sadly long out of print despite his role in an important period of African literature in diaspora. following a chink of light to close the path of escape. I have just been reading Messrs. Omindi and Mboya’s letters in your issue No. 11. Mr. Mboya’s article on African Socialism begins to be clearer. From afar mountains are misty. He must know what he says when he writes ‘these leaders . . . are those most likely to know what philosophy and principles underlie their policies?’ Many would take the point and feel suitably told off.